Look stylish without emptying your wallet with this FREE eBook of 32 low-cost clothing crafts. Turn homemade items into funky fashion! Give your flip flops a whole new look for the summer with this adorable Dollar Store Flip Flops 5 Ways project. From glow in the dark flip flops to easy survivor style crocheted flip flops, you can learn how to decorate boring flip flops. These cute dollar store craft ideas are easy to complete and perfect for anyone on a budget. Gather up some unexpected items like googly eyes and bandanas to complete your own version of this super cute project. When you add your own signature to your shoes, you're sure to make a statement and stand out from the crowd. Get in the summer state of mind no matter the season with this collection of 19 Summer Front Door Wreaths. These fun and creative summer craft projects are perfect for frugal crafters. Greet guests and show off your crafty spirit - your neighbors will surely stop and stare. There are also plenty of Memorial Day and Fourth of July wreath ideas so you can show off your patriotic side. 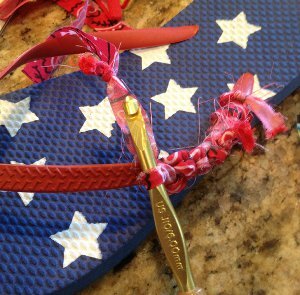 Attach small dream catchers to center of flip-flops with Amazing Goop glue or epoxy. Allow glue to dry for a few minutes. 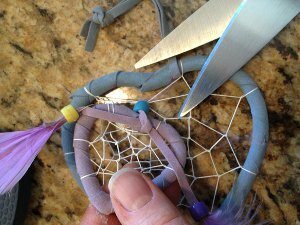 Secure dream catchers to sandals using fishing line and a needle. Wrap and knot the fishing line around the dream catchers in several places to add extra security. Wait until glue is completely dry and cured, according to package instructions. First we have to prepare the bandanna "yarn" by cutting the bandanna into 1/2" strips. 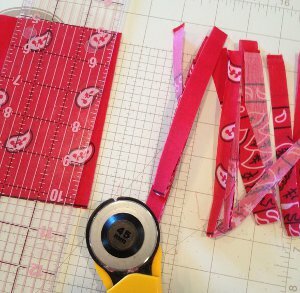 I used a rotary cutter, ruler and mat, but you can also just cut 1/2" strips with your scissors, or even cut notches in the bandanna and then rip the strips. Next knot your strips together at the ends to create one continuous piece of bandanna "yarn." Knot the end of the bandanna yarn around the bottom edge of a flip-flop strap. Trim the knot and hot glue the yarn to itself to secure. Place your hook behind the flip-flop strap and catch the yarn with the hook. Draw it back behind the strap so you have a loop around your hook. Place your hook across the front of the flip-flop strap and catch the yarn with the hook. Draw it through the loop on your hook. You will now have a new loop on your hook. 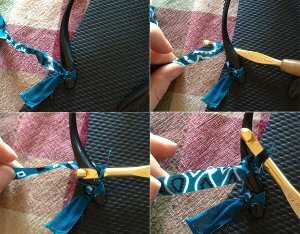 Repeat this process -- hooking over and under the flip-flop strap, until the entire flip-flop is covered with crochet. When you get to the end of the flip-flop, pull the yarn through the final crochet loop and pull to tighten. Glue edge of yarn to the bottom of the flip-flop strap with hot glue. 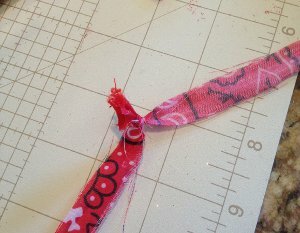 Trim any long pieces of bandanna knots, if desired. Break a bracelet-length glow stick to activate the glow. Gently bend the glow-stick in half. With four small zip ties, secure the glow stick to the straps of your flip flops. 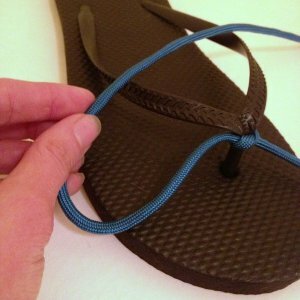 Make sure the knob of the zip-tie faces outward at the top of your flip-flop to ensure that it won't rub against your skin. Tighten zip ties, and trim tails off. The amount of paracord you will be able to use depends on the size of the sandals. The ones I made are men's size 11 so they were large enough to use a whole 16-foot package of paracord; smaller sizes will have smaller straps and therefore you might need a little less cord. 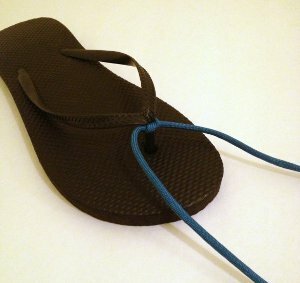 Before you start tying the cord to the flip flops, cut it in half so you will have the same amount to add to each foot. Use a lighter to melt the cut ends and keep them from unraveling. Find the center point of one of your pieces of paracord. With the toe of the sandal pointing toward you, tie the cord to the toe thong at the center point. Pass the cord over the strap to form a loop. 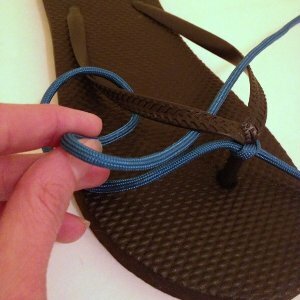 Make sure your loop is to the outside of the sandal, and that as you work you continue knotting in the same direction. Wrap the paracord around the strap and pull it back through the loop. Tighten the knot and repeat. As you add knots, it will look like this. When you finish working down one side, start on the other. 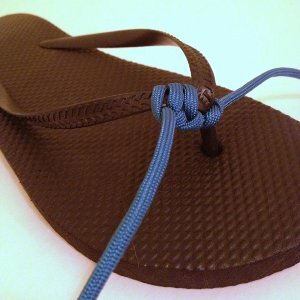 Make sure you keep your loops to the outside of the sandal so that both sides will look alike. One should be a mirror image of the other. You may have to twist the finished straps back into their proper shape; my hubby tried them on and once they were on his feet the straps were fine, so you should be alright. When you reach the end of your paracord or the end of the strap (whichever comes first), trim the excess cord. Melt the ends to seal them and keep the knotting from coming undone. 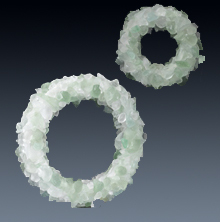 Make sure the ends are melted to the point where they meet the rest of the knot so that it is as secure as possible. In case of emergency, just snip the melted ends to free them and unravel! Glue googly eyes onto flip-flops as desired, using Amazing Goop glue or epoxy. Allow to dry for a few minutes until eyes are set in place. Glue one large googly eye to the center of each flip-flop strap. Allow glue to cure for an hour or overnight before wearing them. These are some great ideas for flip flops to make them your creation and very inexpensive too. I can not wear flip flops because they put blisters between my toes so I wonder if I do the paracord or the crocheted bandana ones if it would keep it from happened and that would not look tacky. I may try it on sandals too with that type of toe. These would also be great for kids too for a new style. These are some great ideas. Check them out. Those Dream Catcher Flip Flops look amazing! Fantastic Ideas! Love the paracord for men, (and women). Dollar Store, here I come. LOVE THE FLIP FLOP IDEAS!